Email: Say It In The Subject - and take part on Friday 15th April! 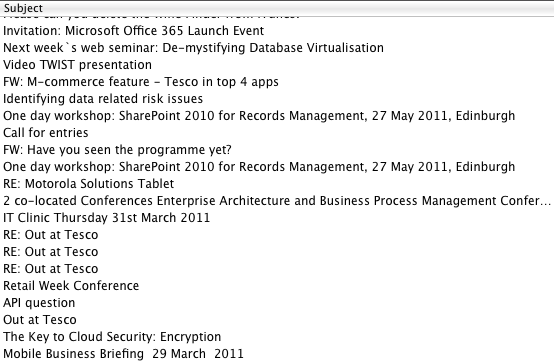 Taking a look at the subject list above - what are these emails about? Which ones allow me to get a good understanding of the content without spending time opening them - especially when I get more that 200 emails to my work email address a day and have to prioritise opening so that it doesn't become a full time occupation? The IT Clinic happening 31st March (though what is an "IT Clinic" without reading the email?). There's some sort of Mobile Business Briefing on 29 March (but is it general or specific?). The rest is a mystery. So do I spend time opening them to get the info, or ignore them? "Out at Tesco" must be about the Tesco staff gay group but "what" about it? What is the "API question"? "Call for entries" for what? I'm going to (try and) launch a new movement called "Email: Say It In The Subject!". This is where you always say the essential information in the subject of your email. But it's more than that: If you are writing an informal email - say to a colleague or friend - why not say the entire message in the subject? Need that R&D Q4 review report by 11am for meeting with Chris. Ready by 10? Happy to meet about XYZ proposal. Thursday at 2pm free for me. You? IT Clinic - get your Tesco laptop super healthy - see us Thu 31st March in Atrium! By reading those email subjects on incoming emails it would be easy for me to scan the subject list and quickly receive all the essential info I need, without opening the messages. Of course some messages will be easier to say in the subject than others, but even then getting the essential info into the subject is better than not trying, as you can see from the examples in my real inbox this morning. Try replacing "R&D Q4 Report" with "R&D Q4 Report - 4 new projects and great feedback from Mike M on ABC prototype" which would make people want to open the message to learn more. Even more importantly, those receiving this report by email but can't give it a high priority would still get some essential elements of the report's content to take away. If you are dealing with suppliers, customers, and the boss's-boss's-boss then a more formal approach is required, but still saying it in the subject will give them greater insight into the content. Allows recipients to receive this information without opening your message. Recipients prioritising email messages to open still always get the info in your message. You get your message across just by appearing in their list of emails! I accept this is going to be easier if you are experienced in shoe-horning interesting comments into the 140-character limit of Twitter. Indeed using that social networking tool got me into "saying it in the subject" in the first place. The number of times I have written in the body of the message, "subject says it all!" has been quite frequent in the last three months. Saying it in the subject is an even greater challenge since you only have 70-80 characters maximum. Now that's great Twitter training in itself! On one day - Friday 15th April - we're going to try and persuade colleagues in Tesco.com (and the wider Tesco organisation if people are willing), to write their emails by "saying it in the subject" - and to expect incoming emails to say it in the subject from their colleagues - just to see if we can get this to work and prove the three benefits listed above, as well as uncover any concerns. You are welcome to join in! If your organisation / department / just your fellow team members are willing to give it ago on Friday 15th April then fantastic. I'll get some poster content ready for you to download, print out and stick on the wall in your place of work (or email for that matter). Stay tuned to this blog for download details over the next couple of days. If there are any journalists or bloggers reading this who would like help get the message out, that would be fantastic and great fun if you think it's a good idea - it would be awesome if the entire nation tried this for a day. It would be great to find out who is taking part so drop me an email or write a comment below if you would like to do it. Tell me what you think, including any concerns. Come on - let's make emails quick to read (and quick to write) by taking part in the experiment on Friday 15th April - Email: Say It In The Subject Day! UPDATE: I have had some feedback by one T4T blog reader who finds that subject-only messages can feel insulting - as "no effort taken". That's why I've set it to a 'day' when people should expect such messages and won't be insulted. It would feel more like receiving instant messages from Live Messenger or an SMS message. If readers perceive the benefit of extracting info and saving time over the 'insult' of brevity, then I think we're getting somewhere. Again it's about protocol - nothing important should be sent subject-only. After 16 months of loyal service to customers, our R&D project application Tesco Wine Finder for iPhone has now been finally removed from sale. The application has reached a natural end-of-life as an R&D project. It has been downloadable from the iTunes App Store since December 2009 using our Tesco.com R&D Team account (compared to production apps which are published using the Tesco PLC account)..
We hope to include visual searching again in our main production apps at some stage in the future, as we process our learnings - mainly about how customers used the app to search for products. I have blogged before how I personally think that barcode scanning is only the beginning of a journey into visual searching. How great would it be to scan the product by simply taking a photograph of any part of the product, not just its barcode? Indeed I visualise taking a photo-scan of an entire meal and getting an app to reveal all its ingredients! The results from using Tesco Wine Finder prove that visual scanning of a product - not just of the barcode - has a great future. It just seems such a natural thing to do. That's really good news - and thank you for telling us through use of this app. Why withdraw it now? Simply maintaining the service supporting the app to cover the latest Tesco wine data and labels was getting too great for a Tesco.com R&D project, and we felt it might become an unfair reflection on our excellent partner, Cortexica Vision Systems, who worked with us to create the service for you. However the excellent findings that ourselves and Cortexica experienced with you using Tesco Wine Finder means that we'll aim to do more in the future. No plans yet but keep watching. In the meantime, please download Cortexica's own excellent visual Wine Finder from the iTunes App Store - click here for a web page with more information. I'd like to thank all the team at Cortexica for their help developing, launching and supporting the app. Their 'vision' (pun intended) really made a difference to our thinking about how to give customers simple yet effective searching tools. I respect all the work of the team there for a job spectacularly well done. If you have already installed Tesco Wine Finder, it won't be pulled from your iPhone but you are likely to find the R&D server service supporting the app unresponsive very soon. Let it go and use Cortexica's own Wine Finder instead! Every morning at 6am, our army of thousands of personal shoppers across our biggest 300 Tesco stores and 3 "Dotcom-only stores" ('sort of' picking depots) set to work picking the first of tens of thousands of grocery orders on a typical day. The technology they use - we call it 'teampad' - is a tablet computer running Windows XP Embedded and an application we have written in Microsoft .Net and C# to help the personal shopper pick accurately and quickly. You can often see our personal shoppers in action in Tesco with their distinctive trollies with on-board tablet computer. The service has worked well this way for years - we've tuned and improved the software in response to our personal shoppers' feedback, but nothing major has happened beyond getting later generation tablets (as old ones reach end-of-life) and better batteries. However, there has been one issue that staff have kept encountering over the years - and now Dotcom R&D is involved in solving it. The issue is that sometimes you may not pick up the product the teampad asked for! The subtlelty of different product sizes comes into play here and you think you have picked up the product described on the teampad but have not. You've then walked all the way back to the trolley, scanned the barcode and told it was not correct, walked all the way back to the shelf to replace the product, and picked the correct one (hopefully) to try again. That's a terrible waste of precious time - and our personal shoppers are telling us this. Indeed the argument they use is that it would be more useful if the information was always on them rather than on their trolley. So we're currently experimenting with a range of portable - some wearable - computer devices to see if this new technology helps. After all, equipment with the sort of computing power we require is now smaller, lighter and with a much longer battery life than before. Experiments continue inside R&D and with our experimental picking team and we'll see where this goes. There are no plans to roll out any new equipment until our personal shopper test team say that it fits their work better than existing technology. Even then we'll have a long distance 'race' between old and new technologies to be sure that "new is better". This is definitely a case of "getting it right" to make tasks simpler for staff rather than using new technology for its own sake. At the Retail Week conference, Ocado CFO Andrew Bracey admitted that they scrape the Tesco grocery site in order to get Tesco prices with which they price match with 8,000 of their own products. Sitting in the audience, I was intrigued by Ocado's admission that they scrape our site (that is, run scripts from client machines that mechanically operate our web site pretending to be a human customer. Such scripts will loop through every department, aisle and shelf, and then harvest the text of all the products that appear on the page). It seems that the days of getting prices by wandering around competitors' branches and making notes has long gone in the digital age! Please note: It is possible to use the Tesco Grocery API to copy all the products from our site, However using such data for price comparisons is expressly forbidden in the API's terms and conditions of use. If we detect this happening, we reserve the right to suspend or terminate your Tesco API's developer account. The mobile team who created the sumptuous Tesco Recipes for iPad application have just informed me that the new version has gone live on Apple's iTunes App Store. If you have already downloaded this free iPad app before then you'll be prompted to update the application when you enter the App store and look at 'updates'. You'll recall me being a big fan of this app - partly because of the wonderful photography and partly because it allows me to shop grocery products online thanks to its ability to add the recipe's ingredients to my Tesco.com grocery basket. I am able to think about meal planning rather than have to think about individual products all the time. The updated version has new content and new features, as well as removing some bugs from the first edition of the application. We've also fully tested it against iPad's new operating system, IOS4.3. This app makes the iPad perfect for kitchen use (and I can tell you from first hand experience that iPads do survive ingredients being accidentally splattered on them!). You can tell if your copy of the app has been updated because the photograph of a Christmas pudding has been removed from the start-up/home-page and replaced with the photography below which is frankly just making me hungry. I must find out who does the photography and shake their hand! I'm just about to leave home to take the tube to the Retail Week Conference (at the Hilton London Metropole on Edgware Road). If you are also attending the conference, I'm on stage for "Stream C - Technology" from 11:20am so do grab a seat in that conference theatre so I can help you can work out if you are the sort of customer who is a Hunter, Gatherer or Groundhog! I'm also joining my fellow colleagues at a couple of tables Tesco has booked as part of the Retail Week Awards tonight where we are nominated for our work on the mobile stuff. So yes I will be dressed as a penguin for the evening! When I'm not on stage I'll be monitoring Twitter so if you want to say hello send a message to @nicklansley and maybe we can meet up during the afternoon. If you work at Tesco HQ and/or have a Tesco computer account then you can read my new blog, Techfortesco Extra (T4T+), where I can often write in more detail about subjects than I can in the public domain. As long as your computer is logged in to the Tesco internal network for UK and Ireland, take your browser to The Hub, and search "techfortesco" in the Quick Search box. 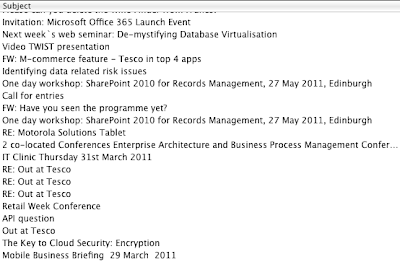 In the search results click on "Techfortesco Extra" to reach the blog. I won't be posting articles on T4T+ that I post here, so to see the full T4T content going forwards you will need to subscribe to both this public blog and the intranet blog. Don't feel left out if you are not a Tesco insider - I put most content here! It's just there are some things I can't talk about so much in public. I hope you understand. Hats off to Dawinderpal Sahota, a journalist with Computing, who has written a great article about my application to be a volunteer Olympic Games Maker at London 2012. Thank you if you are one of a number of people who have written to me about the possibility of a career at Tesco.com. It's great to see that we're inspiring people to consider working with us, and you can have no doubt that our offices are a great place to work. Where appropriate I do pass on your details to the HR team and I leave it to them to get in touch if they think there is a suitable role. However there is an official route to apply that also overcome the possibility that I have missed your message (I get over 200 emails a day). Take a look at the new Tesco careers web site that has been launched with career-seekers in mind. It's packed with information about Tesco, career options, and "how we do things round here". 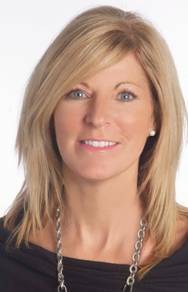 Indeed our HR Director for Retailing Services, Therese Procter (pictured), has said that Tesco's success is down to our simple corporate values: "No one tries harder for customers" and "Treat people how we like to be treated". Head to http://www.tesco-careers.com for all the information you can handle about careers at Tesco. Maybe I'll see you in our office sometime soon! I've just received an email from the London 2012 organising committee accepting my application to become one of thousands of Olympic Gamesmakers that will help keep the two weeks of the Olympic games running smoothly between 27 July to 12 August 2012. The committee detected that I have a technology background (spot on!) and have invited me - along with no doubt hundreds of other techno-savvy people - to a mass 'technology' interviewing session to take place at the ExCEL conference centre in London's docklands on 17th April. I'm not sure how this will work although I do get a disturbing imaginary vision of standing in a queue with other 'tech' hopefuls all shouting to a TV camera that "London has the Tech-Factor! ", and standing on a spot being grilled by a tech version of Simon Cowell. "I'm sorry Nick, but unless you can recite the seven layers of computer networking* it's a No from me". I'm sure the reality will be far more friendly - and if, as it seems, 17 April is the 'tech interview' day for everyone identified as tech-savvy then maybe I'll see you there. Watch the demise of IE6 *LIVE* on a Microsoft web site! If you're a regular reader to this blog you'll remember the article I wrote back in October about web browser trends on our web site (http://techfortesco.blogspot.com/2010/10/web-browser-trends-on-tescocom-site.html). 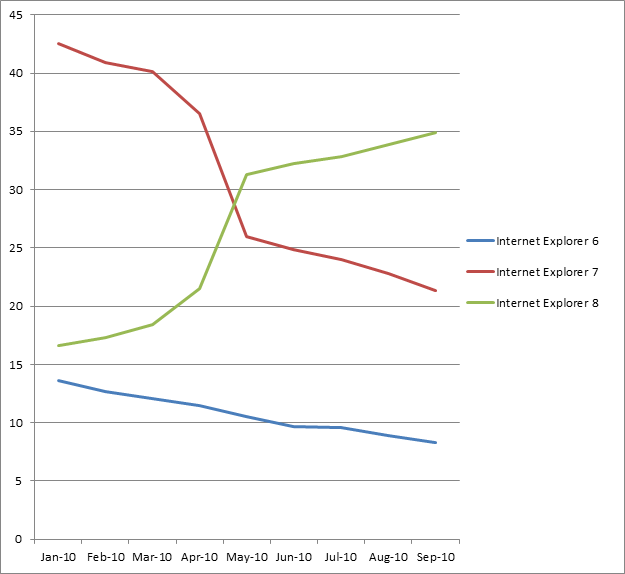 Well now you can watch the worldwide decline of IE6 via a special web site that Microsoft have set up for the purpose. Follow the link at the bottom of this article to go and watch - and even take part in the decline with Microsoft's blessing! "10 years ago a browser was born. Its name was Internet Explorer 6. Now that we’re in 2011, in an era of modern web standards, it’s time to say goodbye. 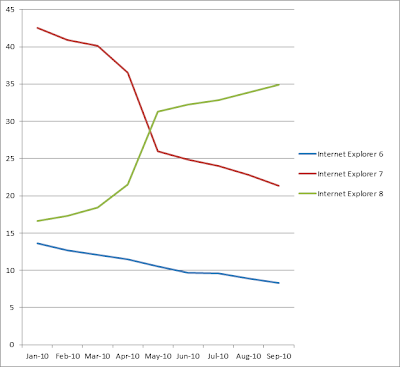 This website is dedicated to watching Internet Explorer 6 usage drop to less than 1% worldwide, so more websites can choose to drop support for Internet Explorer 6, saving hours of work for web developers.". I'm thoroughly enjoying Microsoft's open and honest conversations with the public and with developer communities on all manner of subjects these days. This is further good news for all our web development teams who have to program especially for IE6 and program again for other web browsers. This blog supports the Tesco Charity of the Year, Alzheimer's Society. After a fantastic year supporting the work of children's cancer charity CLIC-Sargent, this blog joins Tesco as we move to support our new charity of the year, Alzheimer's Society and Alzheimer Scotland. These fantastic two charities work to improve the quality of life for people with dementia as well as supporting their families and carers. Dementia is a cruel brain-wasting disease that can happen to anyone. There is currently no cure but with early diagnosis and the right support, people can live well with the condition. This year 100,000 people will develop dementia, that's on top of the 750,000 people already living with dementia in the UK. Almost half of Tesco staff have a loved-one or friend with dementia and the same is true for Tesco customers. Tesco's aim is to raise £5 million to fund groundbreaking research, Dementia Community Roadshows and support services, helping families coping with dementia to feel less alone. In a permanent location at the right-hand side of the web version of this blog at http://techfortesco.blogspot.com you will always see the logo supporting our fundraising. Please do click the logo to head straight to a web site especially set up for the year ahead and please help us reach that £5 million goal between now and the end of February 2012.